Mr. Magellan works for the International Testing Organization, testing a number of advanced technological devices. With his friend Capella, a super-strong antique collector, he thwarts the offbeat schemes of a variety of mad scientists. A recurring adversary is "Casimir Boudu", a meek-looking old man who is in reality a peace-loving, blue-skinned alien whose mission is to slow down Earth's technological progress. Mr. Magellan was originally serialized in the weekly magazine "Tintin", starting in 1969. The first two stories were written by (but not credited to) Jean Van Hamme. Later stories were penned by prolific "Tintin" writer, André-Paul Duchateau. 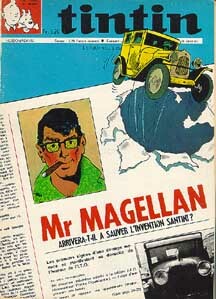 The Mr. Magellan stories were first collected as graphic novels in the 1970s in the generic soft-cover "Vedette" imprint published by Lombard in association with Dargaud. They were reissued in the mid-1980s by Lombard in their own collection, but in a different sequential order, and with additional stories that had not been collected before. The Skblllz is a small, blue, hairy animal who only speaks through consonants and can lay huge eggs with fantastic contents. The Skblllz was published in the form of one-page gags between 1966 and 1970, and appeared in "Tintin" Nos. 909, 914, 924, 925, 933, 938-942, 946, 948, 952-958, 960, 963-984, 986, 988, 994, 996, 997, 999, 1003, 1004, 1019, 1029-1031, 1048, 1055, 1057 and 1113. Hyper X is a super-powered cosmic avenger whose enemy is the intergalactic villain Stragos. 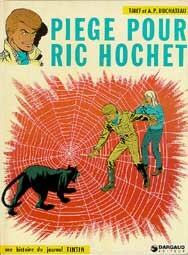 Two stories featuring Hyper X were written by Acar and drawn by Geri, and published in "Tintin" Nos. 1020 and 1055 in 1968 and 1969. Jean Van Hamme (1939- ) is a Belgian writer and novelist whose comics career began in the late 1960s when he co-created a number of adventure series (mostly for "Tintin") such as Arlequin, Domino and the genre series Epoxy (with Cuvelier) and Mr. Magellan. His best-known genre creation, is the popular Thorgal series, with Rosinski. 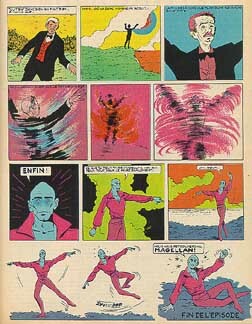 With Rosinski, he produced the remarkable graphic novel, Le Grand Pouvoir du Chninkel [The Chninkel's Great Power], and with Griffo, a two-volume political fiction, SOS Bonheur [SOS Happiness]. 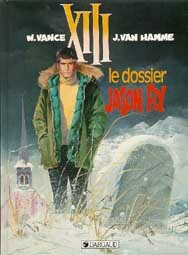 In the 1980s, Van Hamme co-created two hugely successful series, both thrillers dealing in political and international intrigues: XIII (with William Vance) and Largo Winch (with Francq). Van Hamme has also written for the cinema, including Diva (1980) for Jean-Jacques Beinex and Meurtres à Domicile [Murders At Home] (1982) based on a novel by Thomas Owen. André-Paul Duchateau (1925- ) joined the editorial team of "Tintin" in 1955 when he created the popular investigative journalist Ric Hochet (with Tibet). He contributed numerous police and adventure series to "Tintin" throughout the 1960s and 1970s. Even his science fiction and fantasy series usually contain an element of detection. His genre works include Udolfo and Carol Detective with Paape, Chancellor with Sanahujas, Hans with Rosinski, Hyperion with Franz, Pharaon with Hulet, ets. Because of his affinity for mysteries, he was also chosen by publisher Claude Lefrancq to adapt in comics form the adventures of classic detectives such as Arthur Conan Doyle's Sherlock Holmes and Challenger, Maurice Leblanc's Arsène Lupin and Gaston Leroux's Rouletabille. Mr. Magellan © 2001 Van Hamme/Ghion/Duchateau; Skblllzzz © 2001 Ghion. All rights reserved.